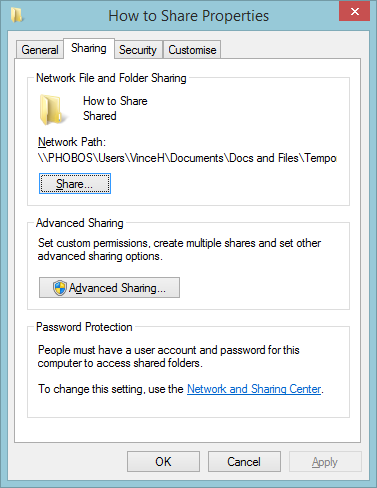 A step by step guide to accessing a Windows Share from RISC OS. 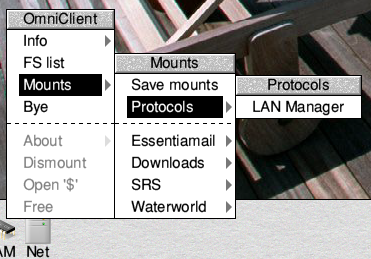 Judging by recent comments on the comp.sys.acorn.networking usenet group, it seems there is a lack of documentation on how use the Lan Manager TCPIP client (referred to simply as ‘LanMan’ from this point forward) on a RISC OS computer to access a shared folder on a Windows computer (a “Windows Share”). More specifically, the discussion concerned LanMan version 2.52, dated 9th August, 2015 – an updated version of the included in recent builds of RISC OS for newer hardware, which now copes with NTLM encrypted log-ins. Previous versions of LanMan supplied with the operating system were unable to handle this type of log-in, which have been a feature of Windows for several years. This, therefore, is a quick step by step guide based on my own set up (RISC OS 5.23 and Windows 8) – it is what works for me and should, I hope, work for anyone using the same version of RISC OS (or greater) and any version of Windows for which this presents a problem – though depending on which version of Windows, and any peculiarities in its set up, some of the places things are found (and how they look) may differ from below! I’ve ‘collapsed’ all the profiles here to reduce the size of the window for the purposes of this post. Click on “Private (current profile)” to expand that section, then look for “File and printer sharing” and turn it on if it isn’t already. If you’ve had to turn it on, click on “Save changes” at the bottom. You are now finished with the Network and Sharing Centre and Control Panel – close them. 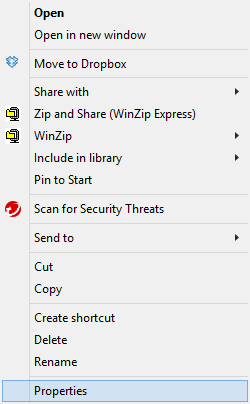 The next step is to tell Windows to share the folder you wish to access from RISC OS, so navigate to that folder from your usual starting point – put don’t open the folder itself; you simply need to be able to see it. 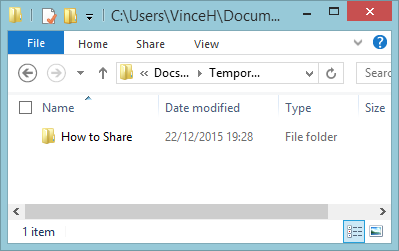 For the purposes of this guide, I’m using a folder called “How to Share” which I’ve placed in a temporary location in my normal documents tree. 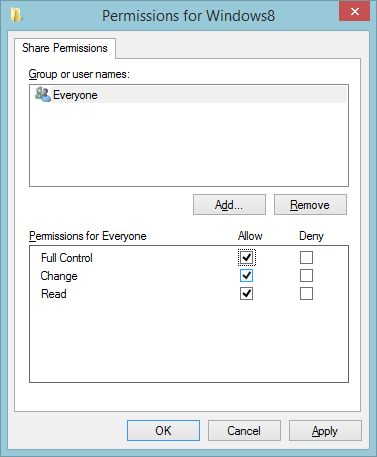 Folder sharing properties – the words ‘How to Share’ in the title bar will be replaced with the name of your folder. Tick the box at the top that says “Share this folder” and enter a suitable name for it in the “Share name” field. This is the name that the outside world – and in this case RISC OS – uses to find the folder on the Windows computer. Make it meaningful, but also simple – do not use any spaces. For this example, since I’m accessing a folder on a Windows 8 computer, I’ve called it Windows8. You will probably find that only ‘Read’ is ticked – but if you want to be able to write to the folder from RISC OS, tick “Full Control” – this will also tick ‘Change’ at the same time. 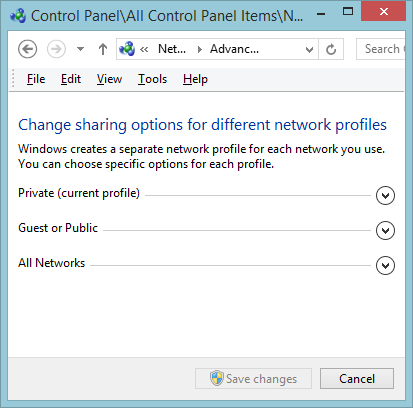 Notice that the “Network Path” is now much shorter – it now consists of the computer name (Phobos) and the name given to the shared folder (Windows8). 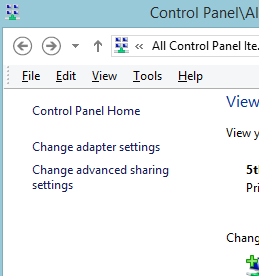 Click on “Apply” and close this window – the shared folder is now set up. 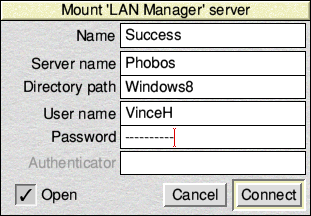 The “Server name” field should contain the name of the computer on which the folder resides – which for me, as explained above, is Phobos, and the “Directory path” field is the name given to the folder when sharing it on Windows. The topmost field, ‘Name’ is the name you wish the folder to appear as on the RISC OS iconbar and, since the above guide suggested giving the folder a meaningful name for sharing, it would make sense to use the same name here – but it doesn’t have to be. The user name should be the user name with which you log-in on Windows, and the password should be the password you use for that log-in. And finally, if ‘Open’ is ticked, when you click ‘Connect’ a directory viewer should open showing the contents of that folder. If you don’t the shared folder should still appear on your iconbar, but you can open it when you need it in the usual way.